Author of twenty-six romance novels, Emily Mims combined her writing career with a career in public education until leaving the classroom to write full time. The mother of two sons and grandmother of six, she and her husband Charles live in Central Texas but frequently visit grandchildren in Tennessee and Georgia. She plays the piano, organ, dulcimer and ukulele and belongs to two performing groups. She sayw, "I love to write romances because I believe in them. Romance happened to me and it can happen to any woman--if she'll just let it." After losing his wife and unborn so to violence, Alex Navarro knew he could never love again, yet, when an old acquaintance comes begging for his help, what starts out as a ruse to save her brother turns into a love he swore he'd never find again. The survivor of a brutal attack, Misty Martinez has just come home to San Antonio to put her life back together when her little brother is framed for selling drugs. Her father insists she help, but to clear her brother's name and find the real culprits she must go undercover, joining a band and posing as the girlfriend of the wealthy widower and owner of the nightclub where her brother worked. Alex Navarro is sensual, compelling…and arrogant and embittered, unable to return Misty's love, as his heart still belongs to his dead wife. Yet their attraction is there, undeniable, mutual, all-consuming. A choice might be made to find pleasure in a moment, but something sweeter begs to be tasted. This love is like the redemption Misty is seeking for her family-difficult, dangerous and the only thing that can destroy the demons of the past. Gina Reyes takes her job as Miss Santa seriously. There are more needy families in San Antonio than money to help them, especially around the holidays. This year she receives an incredible donation that comes with a price, her new co-chair. Her family has felt the sting of his company's Big Picture for the Greater Good philosophy, and the man represents everything she abhors. Lalo Navarro, a son of privilege, wants nothing more than to improve his beloved San Antonio. Imagine his surprise when he learns he's a demon and not a do-gooder. Pushed into accepting the Miss Santa co-chair to raise his political visibility, Lalo is soon humbled by Miss Santa herself, the shapely Gina Reyes, who somehow becomes everything he wants. 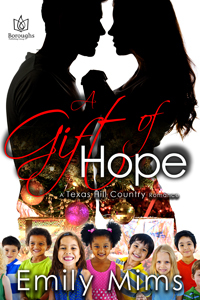 On opposite sides of just about every issue imaginable, the only thing that could bring them together would be to follow their hearts…and then a Christmas miracle. Pleased to have you back again, Emily. Welcome!